(Medina, Ohio, November 9, 2018) Please be advised, due to special event logistics for the 34th Medina Candlelight Walk and ongoing road construction, traffic patterns around the Medina Square will be altered from November 15th at 9:30am through November 18th. This annual event attracts over 25,000 guests to the City of Medina, with an estimated economic impact of over $250,000, and showcases the restored, 19th-century architecture that is home to over 75 independently owned boutiques, restaurants, and shops, which supports the reputation of Medina as one of the best, historic hometowns in the country. Beginning on Thursday morning, November 15th, Broadway Street between E. Washington and E. Liberty Streets will be closed to through traffic. East Smith Road between S. Broadway and S. Jefferson will be open to passenger car, west bound traffic only, Friday afternoon through Sunday evening. Commercial trucks will continue to follow truck detours. East Smith Road will be closed again Monday morning to complete construction. It is highly recommended to plan on extra time if traveling through or around the Square this weekend. The Medina Square will be closed to all vehicular traffic on Saturday, November 17th, from 5:15-6:45pm for the Holiday Parade of Lights and the Light up the Night Fireworks display. In addition, parking adjacent to the Medina Square will be blocked off as no parking from 9am to 7pm on Saturday, November 17th in preparation for the Holiday Parade of Lights. This is done for the safety of event guests and parade spectators. Parking will be available on the outer ring of the Square, adjacent to commercial businesses. There is ample public parking in the parking deck behind the County Courthouse, the City lots on W. Liberty and S. Court Streets, and the County lots on N. and S. Elmwood, as well as behind the County Administration building on N. Broadway. In addition, the public is welcome to park at the former Hawkins Grocery Store, now owned by Medina County Habitat for Humanity at 233 W. Lafayette Road throughout the weekend, or at the Habitat for Humanity Restore at 342 E. Smith Road on Friday evening, Saturday after 4:30pm, and on Sunday. 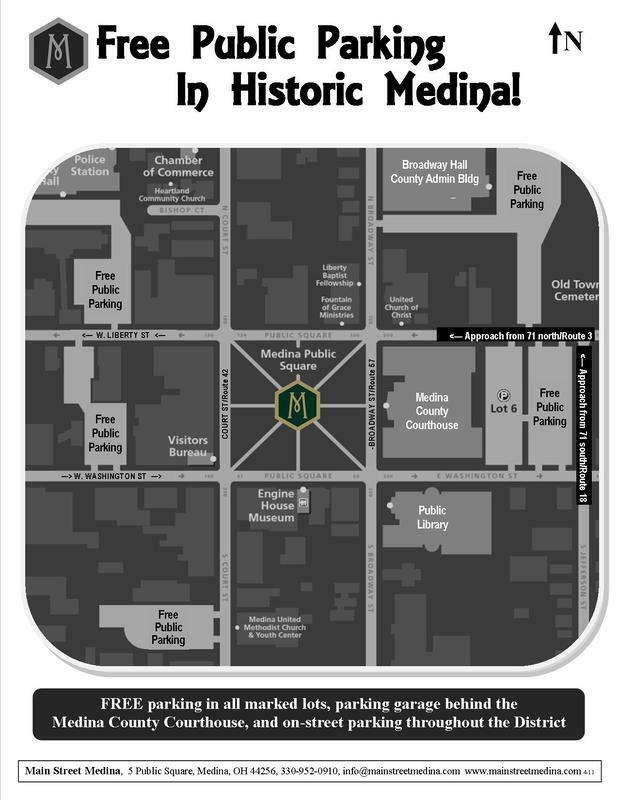 A public parking map is available online at www.mainstreetmedina.com. Event guests are strongly encouraged to carpool, or to walk from public parking outside the Historic District. 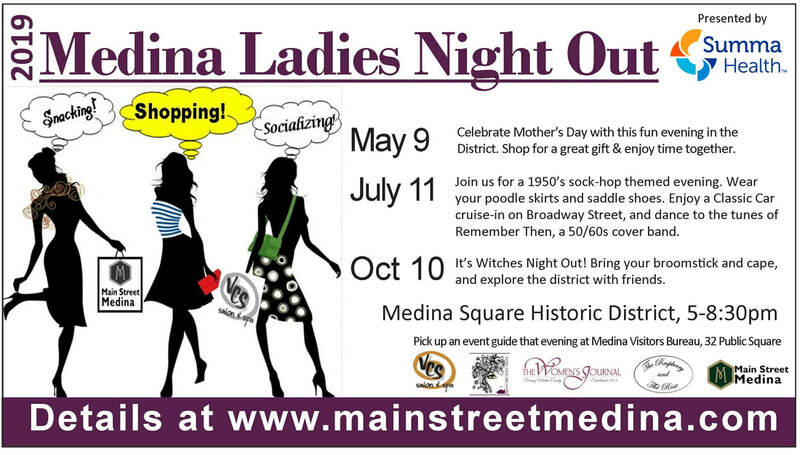 Please visit www.mainstreetmedina.com for event details, parking maps, and street closure information.